We celebrated Aisha's fifth birthday today. Last night, Aisha decided to read two books to David. He insisted she read one of them twice, and after sounding out the hard words, she got it perfectly right. This is a bigger milestone than it may sound because it has meant that Aisha has decided for herself that she can read. Previously, although she was capable of sounding out words and reading lessons, she baulked at reading storybooks. Somehow she thought that it was my job, and perhaps she feared that once she started reading books, I would stop reading stories to her. So when Aisha came out and told me that she had read the books to David, I agreed that we would have a party today and celebrate her turning five years old. 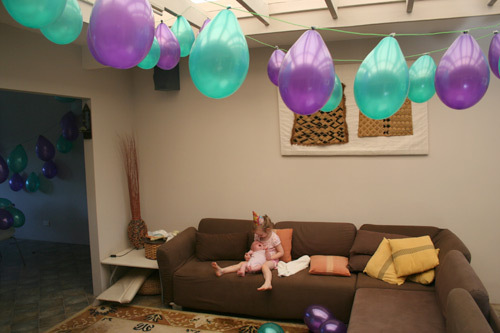 We tucked Aisha into bed, and David and I went down to the shed to start blowing up the balloons — the easy way. 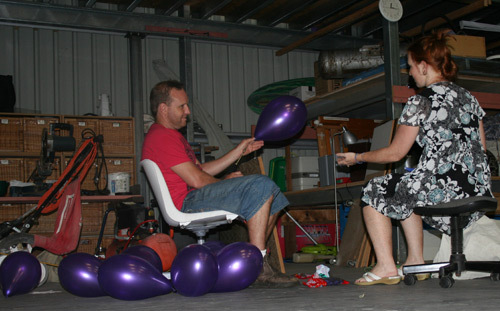 David used his air compressor to blow up 100 balloons, and I tied the knots. 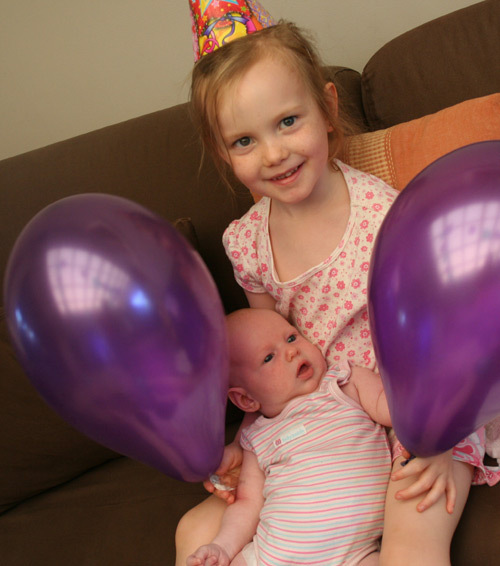 I brought all the balloons up to the house before we went to bed. A couple popped randomly through the night, but it didn’t seem to disturb any of the children. 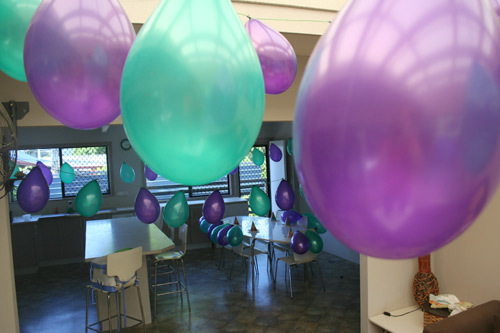 I had strung the balloons up in the living, dining and kitchen areas. First thing in the morning, Aisha asks for a cuddle with Dell. Aisha still loves to take the time to hold Delaney every day. She was already wearing the party hat I had hung on her door knob. I made sure everyone ate a decent breakfast because I knew the rest of the day would be a write-off nutrition-wise. Then when we didn’t eat a “proper” lunch or dinner, I wasn’t so concerned. 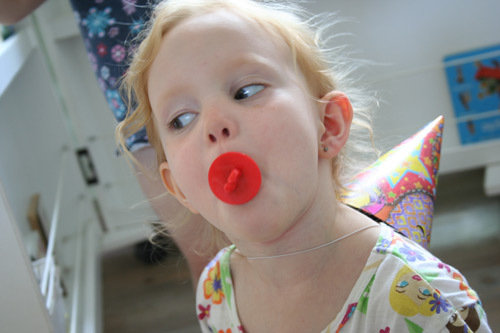 Aisha opened up a little parcel with some lolly rings from Auntie Renée. 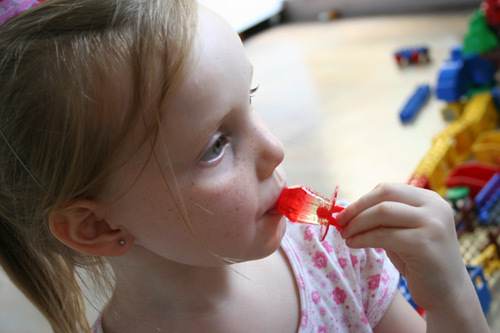 Brioni liked sucking on the lolly as if it was a dummy. Throughout the day, the girls enjoyed chips, slices of cheese, blueberries, mangoes, apricots, some chocolate eggs and even (gasp!) cordial! I baked a couple of very thin cakes and cut them to create the shape of a five (pictured above). 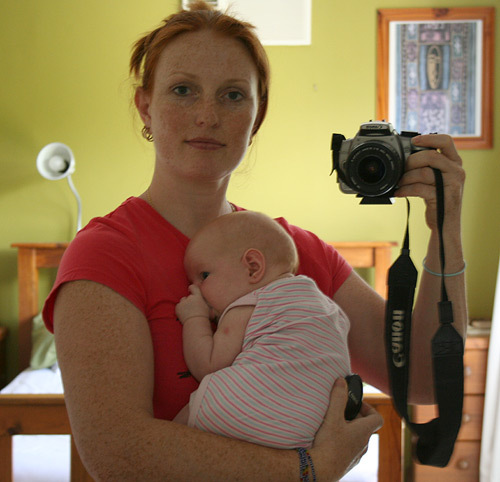 Sometimes it's really hard to put the baby down. I was ready to decorate Aisha's cake, but I didn't want this cuddle to end. When Delaney started to fall asleep in my arms, I put her down again. (She’s only awake for about an hour at a time.) 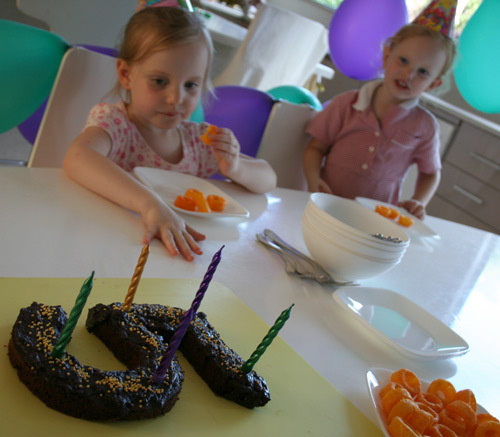 Then I went into the kitchen and finished decorating the cake for our little “party”. When everything was ready, we had to wait for Daddy to wake up from his late siesta before we could begin. We were all ready to light the candles when David received a phone call from someone who wanted to look at the house. The house was not in perfect order — there were balloon bits on the floor, the kitchen was well-used, and toys were strewn throughout the living room. However, when someone wants to look through the house (and they’re RIGHT OUTSIDE), how can you refuse them? 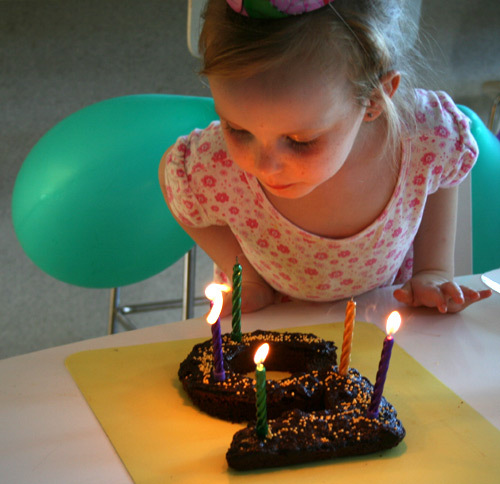 Finally we sang the birthday song, and Aisha got to blow out the candles! The girls loved having ice cream with their cake. Aisha’s spent the whole day working through pages in a schoolbook, and Brioni is feeling a bit left out. I saw Aisha “teaching” Brioni how to sound out words, and I wonder how long it will be before B starts reading too! Aww…happy birthday, Aisha! And congrats on the reading! Love the pic of Aisha cuddling Dell. And Dell sucking her thumb in the pic with you—precious! So stressful trying to keep the house tidy ALL the time! I had a house full of visitors this morning when the real estate rang to bring some prospective buyers through. Thankfully they were happy to come back in the afternoon, but I still had to dash around (with the help of two friends) and get the house in perfect order. Ahh, I hope this will be over quickly. Congratulations to Aisha on turning five, and being able to read! Your house looked wonderful with all the balloons up! its a really warm story. 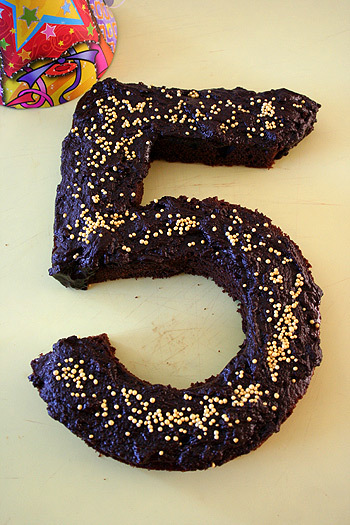 I am very happy for Aisha and congratulations on officially turning the milestone 5!